Nothing looks more glamorous than hair that’s been professionally blow-dried, but it’s a luxury that can be expensive, and time consuming! While air-drying may be the easiest option, the end result isn’t so fab! When done carefully and using the right techniques and products, a blow dry will make you look polished and professional, and plus I always find that good hair gives me a good mood for the day! I was treated to a Blow Dry Masterclass at Aveda a couple of weeks ago, so here are some tips from the professionals for how to improve your blow drying technique. Of course a good blow dry starts with the products that you use in the shower. You should choose products that are formulated for your hair type, or hair concern. 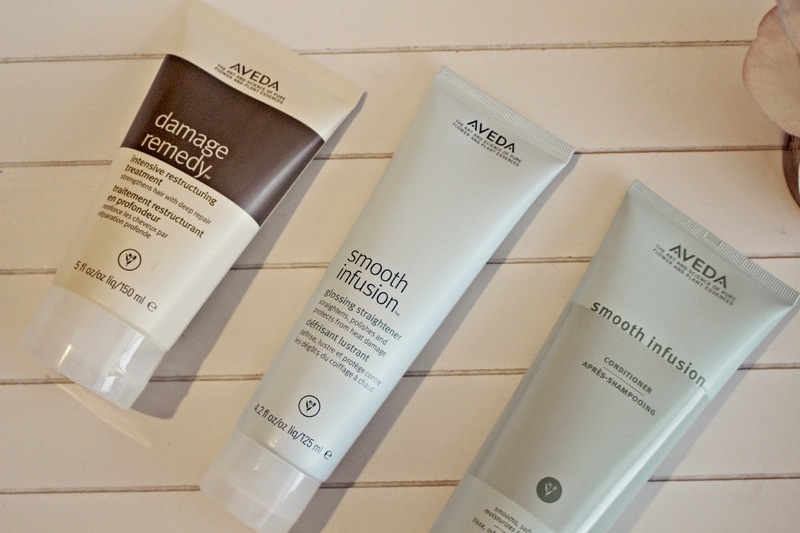 My hair is dry, and coloured, so Aveda prescribed me some products from the Damage Remedy range to help reconstruct my damaged hair, as well as products from the Smooth Infusion range to moisturise and reduce frizz. The conditioner can be used on a regular basis and the plant infusion smooths the surface of the hair to prevent flyaway, and also protects surface damage from heat styling – so ideal if you are going to blast hair with a dryer. Tip 1: Don’t rub your hair with a towel! This causes split ends, friction and frizz! You can however squeeze hair with a towel to remove excess moisture. My hair is usually a dreadlocky mess when I get out the shower, so Michael at Aveda introduced me to the Smooth Infusion Naturally Straight product, smoothing it through the ends of my hair before taking a large paddle brush and combing it through. The product is ideal for those with frizzy or curly hair, as the plant-derived fibres create a locking layer to hold your hair, and also create a barrier against humidity, which majorly helps fight against frizz. It’s smoothing powers make combing through hair much easier; for thick hair, a paddle brush is recommended. The Aveda brush detangles and also stimulates the scalp (ooh la la!) but it’s also incredibly lightweight, surely it isn’t just me that gets arm ache when blow drying!! Tip 2: Good products will save you a lot of time! It’s important not to skip on the styling products, as this will help your blow dry last longer and look fresh for longer too. Michael took small sections of my hair and applied the Pure Abundance style prep spray to the roots. This is a weightless product which adds heat protection, boosts volume and helps hold the hair in place. Now that your hair is prepped, it’s onto the actual blow dry. 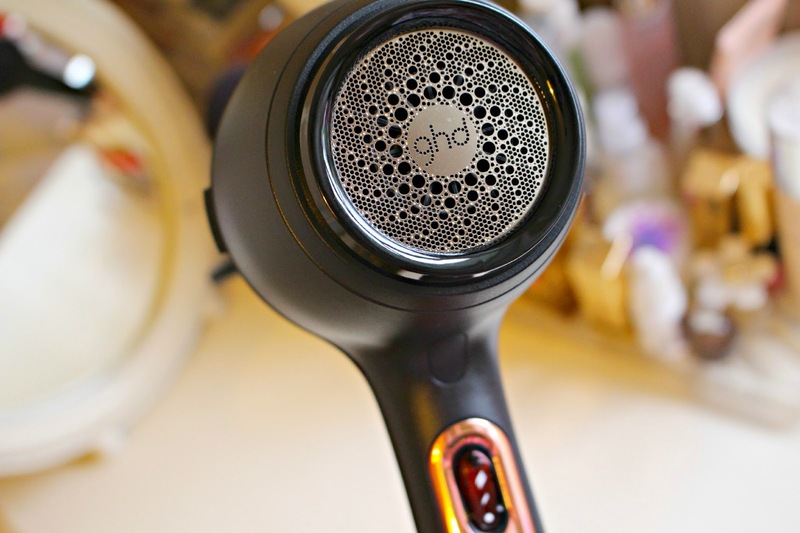 I use the GHD Air dryer, it’s extremely powerful without being too noisy, so hugely cuts my blow dry time. 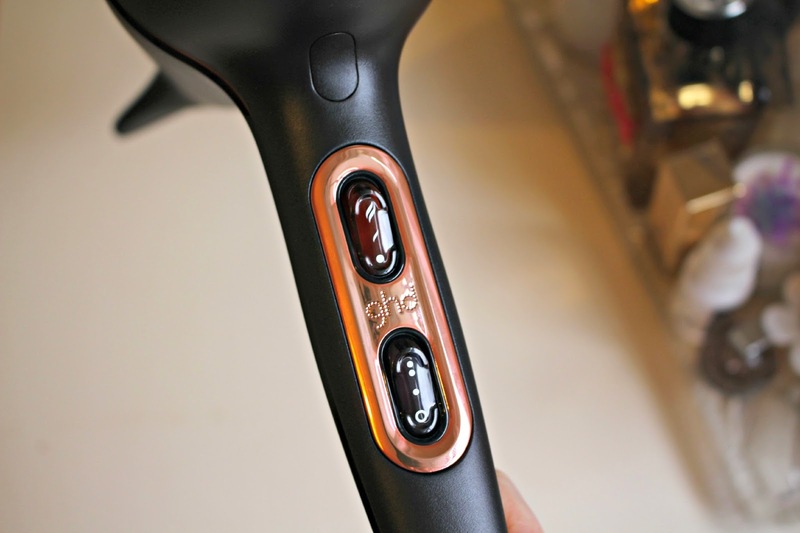 GHD have patented their ionic technology, which locks moisture into hair making it softer and shinier, and it also works with your products to reduce frizz. The nozzles (it comes with two) concentrate the heat, so you can straighten hair without using straighteners. There’s also variable controls for heat and temperature, so you can tailor the technique depending on what style you are looking to achieve. It’s £89 from LookFantastic here. Tip 3: To cut time, start by rough drying hair using fingers, on a low heat and intensity setting. In the picture below, I set both the switches to the middle setting. Focusing on the ends of your hair, keep moving the drier all over your head so hair is evenly dried. Michael told me that by focusing on the ends first, hair won’t be weighed down. With hair is about 70% dry, move onto the roots, and pull them away from your scalp to create volume. Tip 4: When sectioning your hair, the bigger the section, the longer it will take to dry. Next, the styling. If you want a real glamorous blow dry effect, section your hair and comb through with your fingers, running the drier through your hair section by section. You can also use the paddle brush here to smooth hair even further. The final section should be a horse shoe shape on the top. Use a volumising ironic root spray here (such as Aveda Pure Abundance) and lift hair away from the scalp as you dry to create volume. Tip 5: Keep the dryer about 6 inches from your hair. Maintain this distance from your hair so as not to burn hair particles, and always blow-dry down the hair shafts so that you avoid causing damage to the hair surface. It’s also important to keep the hair dryer moving, if you focus on one area for too long, it will burn and dry out the hair, instead of just drying it gently. If your hair is damaged, then you can build up the surface by using a treatment such as the Aveda Damage Remedy about once a week. Tip 6: Leave your hair a little damp. When hair is about 80% dry, focus on the end look; if you want straight hair, you should be using the paddle brush and focusing the heat on the flattened hair as you comb it through. For a more voluminous curl, use a large barrel brush. By leaving hair 90% dry, you will be leaving in some moisture and preventing your hair from drying out. Tip 7: Blast with cold air. When you’ve finished styling your hair, blast hair with cold air (there is a snowflake button on the GHD Air which does this automatically) to lock in shine, and style. Then, use the paddle brush to gently detangle hair. 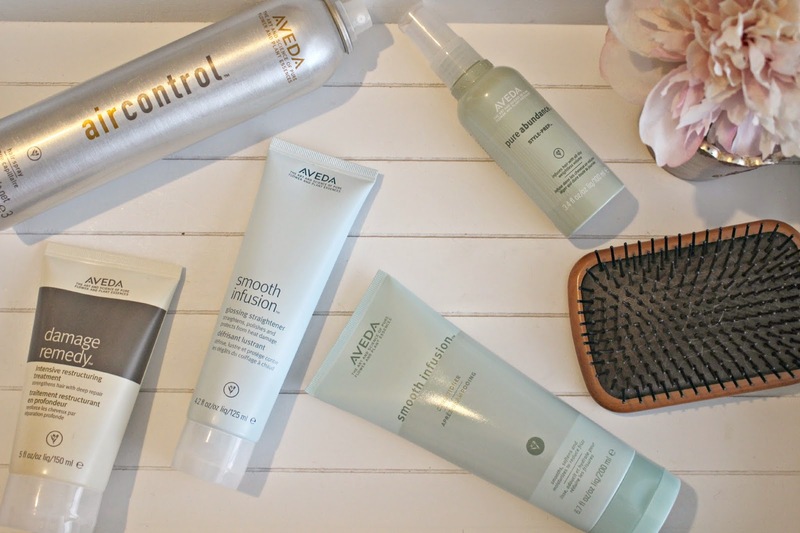 I usually finish with a moisturising serum and spritz with a lightweight hair spray to hold the finished style, Aveda’s Air Control Hair Spray gives a flexible hold and doesn’t leave a wet finish to hair. So there’s my top tips on how to achieve the perfect blow dry! Thank you to Michael at the Aveda salon for sharing his tips with me. 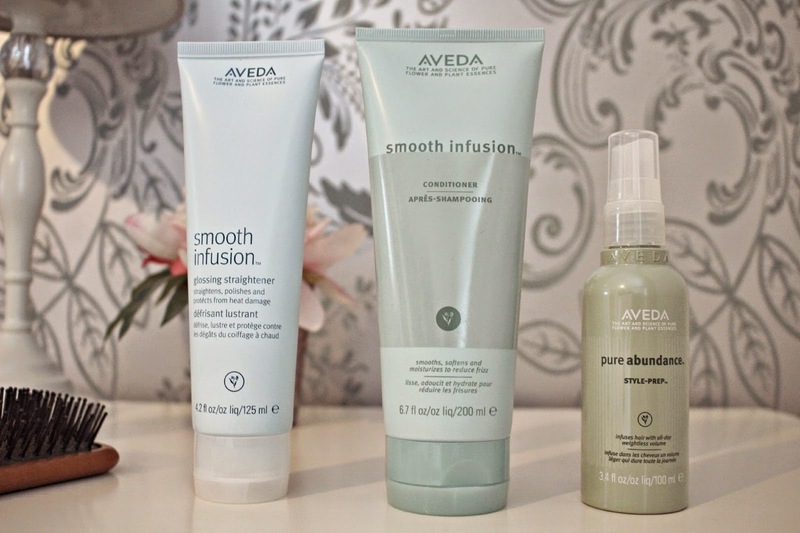 You can shop all the Aveda products from their salons, and also online here. Do you have any Blow Dry tips to add? Next Post Keeping Fit when It’s Chilly!